The Slow Food movement organized their annual meeting for conviviums in France on the 29th of June, in Gap. The convivium of Châteauneuf-du-Pape was actively involved in international events organized by Slow Food such as the 'Salone del Gusto' in Turin, 'le salon Cheese' in Bra and of course, the Eurogusto Tours. Locally, the convivium promoted French products whose existence were threatened such as the black porc of Bigorre, pasteurized cheese from the Pyrenées Bearnaises, the lentils of Saint-Flour, the 'Brousse du Rove', and the spelt of Haute Provence ... all off which were represented during local tastings and at exhibitions such as Vinisud and Vinexpo. 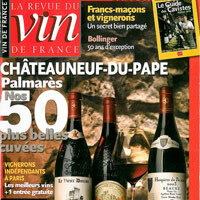 Unfortunately, due to a lack of new members and activities, the convivium of Châteauneuf-du-Pape was abandoned. However, a year and a half later, it is in the process of reestablishment. During the annual meeting in Gap, biodiversity was the main topic of discussion. It will be the responsibility of each convivium to identify a product or tradition that is endangered in order to reverse its declining existence. This means that the convivium of Châteauneuf-du-Pape must ponder over the diverse local products that range from, for example, Picardan to Terret and from Vaccarèse to Counoise. For more information and membership inquiries, please contact hortense@chateauneuf.com or www.slowfood.fr.